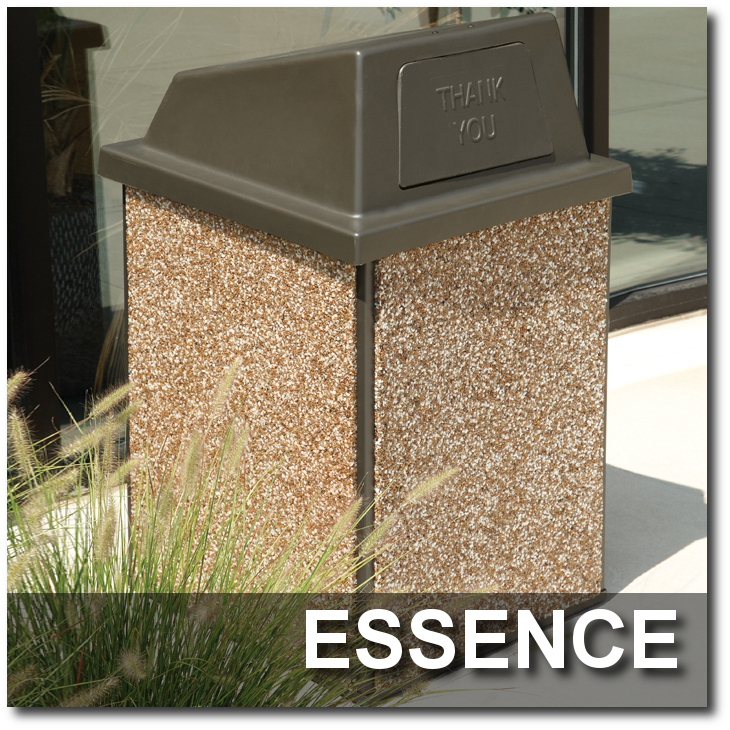 The Essence Collection is a time-tested favorite among stone finished outdoor trash receptacles. Designed to endure harsh weather conditions, these beautifully crafted receptacles are available in standard or heavy-duty versions with strong galvannealed steel creating a rugged frame. Choose between five natural stone colors - River Rock, Golden Glo, Alpine Red, Coffee Bean or Black Lustre. A wide variety of tops makes it easy to create the right look with both form and function. This expansive collection ranges in sizes from 8 gallons up to large 48 gallon capacities for high-traffic areas. Sand and weather urn top are also offered for safe cigarette disposal. For an attractive waste management solution that performs with a natural appearance, check out the Essence Collection Stone Trash Receptacles available on sale now!